Personnel - Ilhan Ersahin: saxophone; Alp Ersonmez: bass; Izzet Kizil: percussion; Turgut Alp Bekoglu: drums + guests Erik Truffazz: trumpet; Ibrahim Maalouf: trumpet; Nils Petter Molvaer: trumpet; Dave Harrington: guitar; Mauro Refosco: percussion; Arto Tuncboyaciyan: percussion; Kenny Wollesen: drums. New York-based Swedish-Turkish saxophonist Ilhan Fredrik Ersahin is not only an eclectic musician and composer but also a successful club owner since 2002, the year he opened Nublu in Manhattan’s East Village. 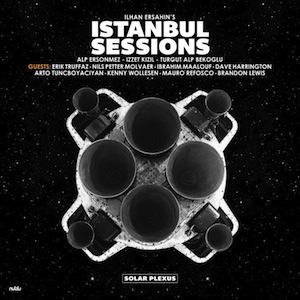 Boasting the same alternative sounds this club has been cultivated for more than a decade, the project Istanbul Sessions has another album coming out on Nublu Records with the title Solar Plexus. The core members - bassist Alp Ersonmez, percussionist Izzet Kizil, drummer Turgut Alp Bekoglu - are joined by a set of respected guests on this album, broadening textures and creating gripping soundscapes. They are French trumpeter and longtime collaborator Erik Trufazz, drummers Kenny Wollesen and Brandon Lewis, guitarist Dave Harrington, percussionists Mauro Refosco and Arto Tuncboyaciyan (also a singer), and trumpeters Ibrahim Maalouf and Nils Petter Molvaer. “Overture Solar Plexus” mixes atmospheric synth, saxophone wails, and pounding rhythmic strokes that have little in common with the dancing percussion of the piece that follows it. On “Farewell to Earth”, the linearity of the bass groove, laid down with a quasi-tribal, funky feel marks the nucleus of this piece, which explodes with seismic intensity in the last minute with a rampant synth invasion. “Infinite Gathering” feels like a work song. Introduced by a rebellious saxophone and wet percussion, this number also displays epic chants uttered with the force of Karmina Burana. Before the triumphant finale, there are soaring trumpet lines and keyboard-driven modulations that take us to Jocelyn Pook’s mechanisms used in Kubrick's Eyes Wide Shut. The longest piece, at more than 11 minutes, is the flickering “Pris”, a trippy voyage that is not averse to dark tonalities, especially in its last phase. Along the way, you will find melodious trumpet, lamenting vocals, psychedelic synth sounds, distorted guitar, saxophone aphorisms, and a static rhythm established by the deep resonance of electric bass and mallet drumming. Ersahin explores saxophone timbres with echoing effects on “Rachel & Rick”, which starts off with airy electronic pointillism. The music goes through a radical change when an elated, danceable rhythm is put into practice before returning to calm waters. Malleability is a key factor in the group’s performance and that is obvious on pieces like “Moon Dance”, a trip hop-ish exercise with an invariably downtempo vibe a-la Massive Attack; the contemplative yet rhythmically uninhibited “Sea of Stars”; and the imaginative yet unsettled closing piece, “Arrival”, which was wrapped in wha-wha acidity in a part obscure, part primal exploration. Ersahin makes use of his wide-ranged influences to explore mood with a sense of comfort and delightfulness. If you have a penchant for the experimental ambient genre in its multiple variations and forms, this is a record for you.